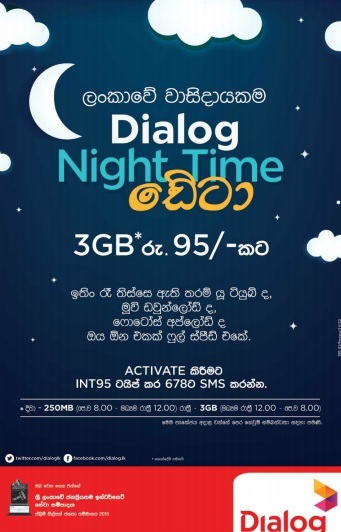 Srilanka's fastest internet provider Dialog introducing most cheapest night time data package for their prepaid users the name "Dialog 3GB data package". Now, Dialog prepaid users can get 3.25GB of data for Rs 95.00. The Dialog 3GB data package offer 3GB data 12 midnight to 8 am and 250MB data 8 am to 12 midnight. To activate Dialog 3GB Night time Data package type INT 95 and sms send to the 678. After activation package valid for seven days. For more information's about this Dialog data package call 1777. This is paper article published by Divaina news paper about New Dialog 3GB Data Package. Activate New Dialog 3GB Data Package : Type INT95 send sms to 678.